As the new year opens, Post Master Donahue is still preparing ways to cut Saturday Mail Delivery and downsize postal service facilities where mail is sorted — in moves that are designed to sabotage and destroy a successful public service. Two new bills are being introduced into Congress, legislation designed to keep the postal network intact: H.Res. 12 to preserve six-day delivery and H.Res. 28 to protect door delivery! 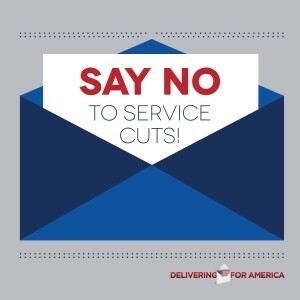 To stay tuned in on how you can help support this important legislation, and to learn about other actions, go to DeliveringforAmerica.com. Hands off the U.S. Post Office! Save Saturday Delivery!